I sometimes have this horrible feeling that 17-year-old Jonathan would punch 27-year-old Jonathan in the face if they ever met. 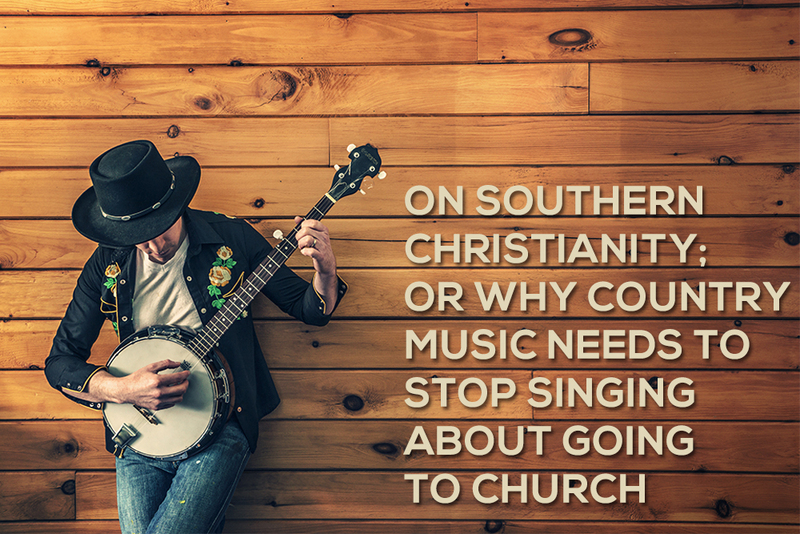 Sure, there are a ton of different reasons for that, but most of all, it’s because I like to listen to country music now. Don’t get me wrong, the 17-year-old pop punk loving, corporate hating, closet rebel is still alive and present, but now that kid also appreciates southern twang and the town he grew up in. Country music tells stories better than any other genre. It walks you through life, gives you something to relate to, and plays with your emotions. It makes you want to dance, cry, or ride down back roads with the windows down and nowhere to go. (Side note: I’m pretty sure that last bit is the theme of 12 songs on country radio right now.) More than any other genre, country music feels like America in the south. In the south, there’s this pervasive mentality that you go to church. You may not have gone since Easter, but if someone asks you where you go to church, you always know to answer it with, “Oh I go to (insert church here).” Going to church is as much a social status as it is a religious obligation. Nothing portrays that mentality better than two country songs that have come out in the past year. In one song, called “This Is How We Roll,” the band is singing about what southern life in 2014 is all about. It’s country music mixed with hip hop. It’s big trucks and flat bill hats. It’s urban and country fused together. He’s saying we do what we want to do, live how we want to live, and then we show up in church on Sunday only to do the same exact thing when Monday rolls around. Church is a 90 minute thing we go to in the south. When I was a freshman in high school, there were two upperclassmen guys I went to church with who I looked up to: Jamie and Philip. I remember sitting in church next to them and hearing Philip ask Jamie, “Hey man. What’d you drink last night?” He rattled off a couple cheap alcohol names and Philip responded with much of the same. They cussed on them Mondays, prayed on them Sundays, passed it around and dreamt about one day. As a 14-year-old kid interested in Jesus but getting turned off on the whole church thing, my negative concept of church was only reinforced by those two guys: church is a social club where people try to look good in front of each other. They don’t care much about Jesus. Nothing described my Christian college experience better than the chorus of this song. I was surrounded by guys who wanted to drink and party on Fridays and Saturdays then show up at church on Sunday. They wanted to meet the good Christian girls who wanted to do bad, unChristian things throughout the week. They wanted to look good in front of each other. They didn’t care much about Jesus unless it helped them get a date. Being surrounded by this mentality and people who wanted to portray the Southern Christian persona turned me off from the church. I wanted nothing to do with Christians or church or anything of that sort. Jesus was cool, but church wasn’t. What I didn’t realize at the time was that saying I was cool with Jesus but not with church was saying I was good with Jesus but not his bride. If someone doesn’t like my wife, there’s a good chance we’re not going to have the best relationship. My wife is incredibly important to me so if you have a problem with her, it’s going to impact your relationship with me. If you’re reading this today and you’ve been negatively affected by Southern Christianity, let me first apologize. I’m sorry you’ve dealt with people who were more about themselves than about Jesus. I’m sorry these experiences have harmed your view of what church could and should be. Most of all, I’m sorry all this has hurt your relationship with Jesus. With that said, please don’t throw the baby out with the bath water. Don’t give up on a 2000-year-old movement that has survived scandals, war, and manipulation. Southern culture doesn’t have to negate the most powerful entity on the planet: the local church. It took me nearly ten years of being anti-church before I finally found the church that taught me what a church was supposed to be. Unfortunately not every church is healthy, and sometimes you have to sort through the rotten ones to find one that’s healthy, but if you’re willing to work for it, it’ll be the one thing that impacts your life more than anything else. I love the church even more.